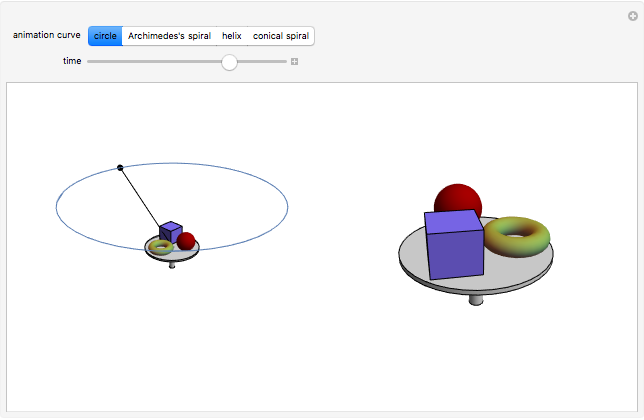 This Demonstration shows animations described by parametric equations. 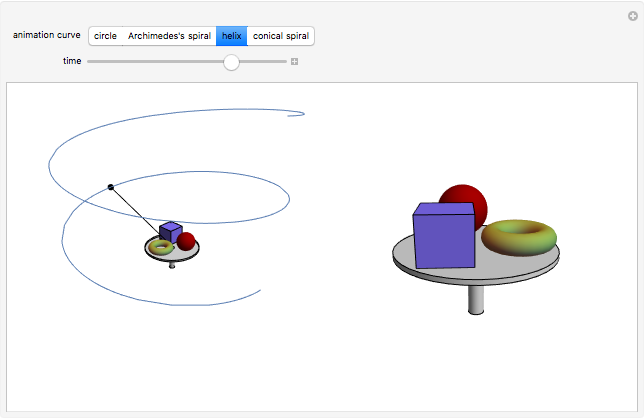 The camera moves on a circle, an Archimedes's spiral, a helix, and a conical spiral. The camera (shown as a little sphere moving on the curves) and its view of a simple 3D scene (which consists of a table and some things on it) are shown simultaneously. For more information about dynamic aspects of parametric equations and camera animations, see the article (in German): A. Filler, "Herausarbeiten funktionaler und dynamischer Aspekte von Parameterdarstellungen durch die Erstellung von Computeranimationen," Mathematische Semesterberichte, 54(2), 2007. or the (shorter) English version: A. Filler, "Discovering Functional and Dynamic Aspects of Parametric Equations by Creating Computer Animations," in Proceedings of the Ninth International Conference of the Mathematics Education into the 21st Century Project, "Mathematics Education in a Global Community," Charlotte, NC, (D. K. Pugalee, A. Rogerson, and A. Schinck, eds.) 2007 pp. 187-193. 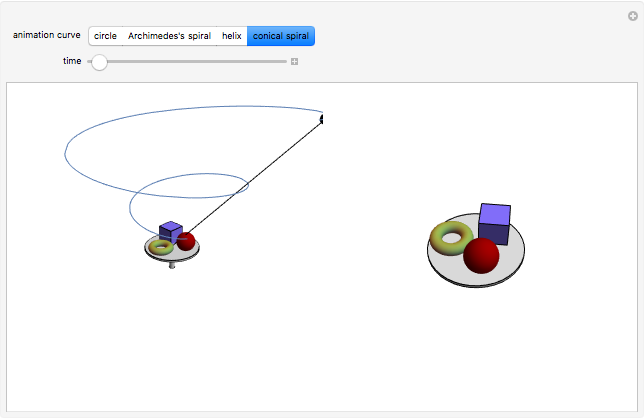 Andreas Filler "Camera Animations on Circles, Spirals, Helices, and Conical Spirals"